Honeypot has a 99.98% catch-rate. 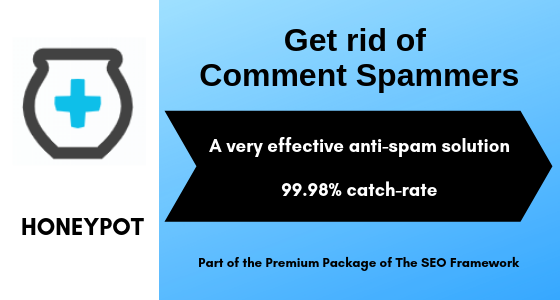 This extension to The SEO Framework catches comment spammers through four lightweight yet powerful methods. Because WordPress’ comment system is open, it attracts unwanted comments. To reduce comment spam, you could manually moderate the comments, but this is very time-consuming. The Honeypot extension stops automatically inserted comments, saving you loads of time while improving SEO. Honeypot protects all themes and plugins that use the default WordPress comment forms (including WooCommerce product reviews) and is hidden from visitors. Your site is protected from spam in the background. Moreover, it works super fast. All this makes the Honeypot extension more favorable than other solutions. Note: Honeypot is part of the Premium Package of The SEO Framework.